We can thank Hippocrates for the famous quote, “Let food be thy medicine and medicine be thy food” — which we translated to “food is medicine”. Hippocrates and the Ancient Greeks were onto something when they studied the therapeutic properties of food. 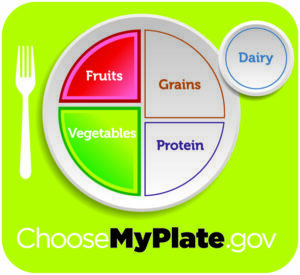 Today it is strongly encouraged that we make half of our plate fruits and vegetables but why is this so important? In the simplest of terms, eating a variety of fruits and vegetables provides numerous vitamins, minerals, antioxidants, and phytochemicals that have enormous healing powers. In fact, research has shown people who eat more vegetables and fruits as part of an overall healthy diet are likely to have a reduced risk of some chronic diseases. Healthy eating patterns include a variety of vegetables from all of the five vegetable subgroups (dark green, red and orange, legumes, starchy, and other) as well as fruits, especially in whole form. These include all fresh, frozen, canned, and dried options in cooked or raw forms, including juices. Although fruit juice can be part of healthy eating patterns, it is lower than whole fruit in dietary fiber and when consumed in excess can contribute extra calories. When juices are consumed, they should be 100% juice, without added sugars. The recommended amount of vegetables in the Healthy U.S.-Style Eating Pattern at the 2,000-calorie level is 2½ cup-equivalents of vegetables and 2 cup-equivalents of fruits per day. Learn more about our nutrition efforts here.